A potager plotting and fine weather praying individual, with a slight tea drinking habit. I was dubious about the possible delights of pecan pie, there’s an awful lot of talk about it which I considered to be hype. My doubts have been put to rest by my mother’s very own recipe. As it is Mother’s Day weekend I thought it was the right time to share the recipe, and publicly confirm my appreciation for it and her! 1) Make short crust pastry (or buy it), leave to cool in fridge for half an hour, then roll out to fit pastry case. 2) Blind bake the pastry case for 15 minutes at 200 degrees Celsius. Then turn oven down to 160 degrees. 3) Melt the butter in a saucepan, stir in the sugar and golden syrup. 4) Remove from heat and leave to cool. 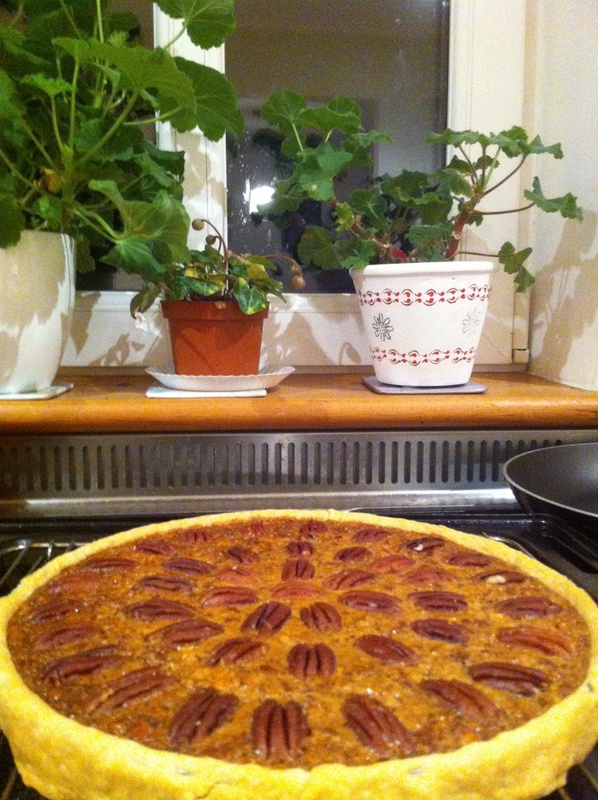 5) Grind up half the pecan nuts (use remainder to decorate). 6) Add ground pecans to the butter and sugar mix. 7) Slowly stir in the beaten eggs into the pastry case. Decorate with remaining pecans. 8) Place in oven at 160 degrees Celsius for 30-40 minutes, until centre is firm to the touch. Sharing hints, tips and gardening triumphs!